This tutorial describes how to bring a virtualized item into view using the RadTreeView.BringPathIntoView() method. Add a new item in the RadTreeView.ItemsSource collection, bring it into view and select it. Let's start by setting up the business models that will define the hierarchy displayed inside the RadTreeView control. First we'll need a ViewModel describing the items in the tree. Please have in mind that in order to use the BringPathIntoView() method, we need to have the path to each item. This is why we will build a method inside each business item that constructs its full path. However, in order to do so, we'll have to keep a reference to the parent of each item. In order to complete the BusinessItem class implementation, we'll only add an IsSelected property so that we can easily control the selected state of each RadTreeViewItem. We'll also have to implement the INotifyPropertyChanged interface in order to notify the view (respectively the RadTreeView) for any changes in the value of the IsSelected property. Now that our ViewModels are all in place, we can define our view and the RadTreeView control. Please keep in mind that the BringPathIntoView() method will work properly only if you set the TextSearch.TextPath attached property. This is due to the fact that the method internally uses the TextPath value to match the path of each business item to its corresponding container of type RadTreeViewItem. Therefore the value of the property has to be the name of the business property that is used to create a path to each node. As the BusinessItem class defines the Path through the Name property, we need to extend the RadTreeView definition by setting the TextSearch.TextPath property to Name. As our scenario requires us to keep track of the selection in the RadTreeView control, we'll also add a RadTreeViewItem Style to bind the IsSelected property to the appropriate data object. Next, we'll extend our UI by adding a few TextBoxes and Buttons to allow our users to enter a header of an item and bring it into view. 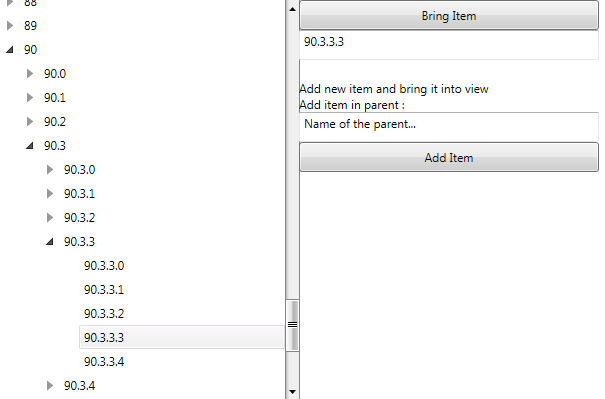 We'll also allow the users to add new items in the RadTreeView by entering the Header of their parent. Now that we've defined both our viewmodels and our view, all we have left is to implement our code-behind logic for bringing an item into view and for adding a new item in the RadTreeView.ItemsSource collection. First, we'll set the ItemsSource of the RadTreeView and immediately bring the 90.3.3.3 item into view. The above logic will build the RadTreeView Items collection, and as soon as the RadTreeView is properly loaded, the BringPathIntoView() method will find and bring the item with Header of 90.3.3.3 into view. You can find a complete solution in this blog post.